Dr. Ali Sepehr answers some of the most frequently asked questions regarding rhinoplasty surgery and candidacy requirements for the procedure. 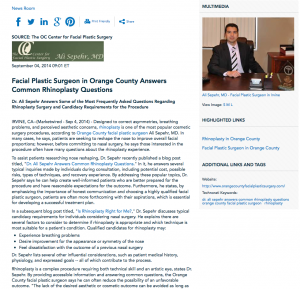 Irvine, CA—Designed to correct asymmetries, breathing problems, and perceived aesthetic concerns, rhinoplasty is one of the most popular cosmetic surgery procedures, according to Orange County facial plastic surgeon Ali Sepehr, MD. In many cases, he says, patients are seeking to reshape the nose to improve overall facial proportions; however, before committing to nasal surgery, he says those interested in the procedure often have many questions about the rhinoplasty experience. To assist patients researching nose reshaping, Dr. Sepehr recently published a blog post titled, “Dr. Ali Sepehr Answers Common Rhinoplasty Questions.” In it, he answers several typical inquiries made by individuals during consultation, including potential cost, possible risks, types of techniques, and recovery experience. By addressing these popular topics, Dr. Sepehr says he can help create well-informed patients who are better prepared for the procedure and have reasonable expectations for the outcome. Furthermore, he states, by emphasizing the importance of honest communication and choosing a highly qualified facial plastic surgeon, patients are often more forthcoming with their aspirations, which is essential for developing a successful treatment plan. Dr. Sepehr lists several other influential considerations, such as patient medical history, physiology, and expressed goals – all of which contribute to the process. A graduate of the University of California, Los Angeles School of Medicine, Dr. Sepehr is a fellowship-trained, board-certified facial plastic surgeon. In addition to actively participating in several esteemed medical organizations, including the American Academy of Facial Plastic and Reconstructive Surgery and the National Board of Medical Examiners, he has authored several chapters in textbooks and scientific papers featured in numerous facial plastic surgery journals. When not at his practice, Dr. Sepehr educates fellows, residents and medical students at the University of California, Irvine in the latest facial plastic surgery techniques. Dr. Sepehr is available for interview upon request.